Aukey has produced a nifty projector which is very portable, and offers a useful (albeit somewhat buggy) spin on Android, as well as a good quality projection – albeit one that’s best viewed in a dimly lit room. Given the low price of large-screen televisions these days, it’s not surprising that the usage of projectors has markedly declined. Those in the business of making these devices have been forced to become more selective about the niches they address, while innovating away some of the traditional issues associated with projection technology. The Aukey Projector, which currently retails at £349 (around $460, AU$590), is a prime example of new thinking, where portability and flexibility are the new buzzwords for achieving commercial success. 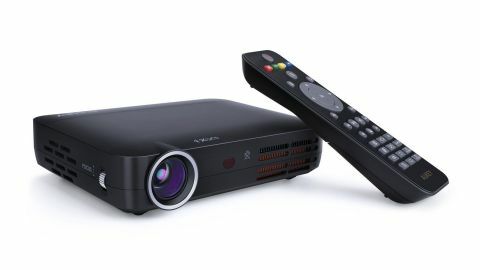 Viewed in isolation, the Aukey Projector looks very much like the larger business-oriented projectors that many companies bought a decade or more ago. Except this one has been miniaturized into a tiny box just 158mm wide, 122mm deep and 36mm high. The small size of this device creates an expectation of compromise, but the more we delved into the Aukey Projector, the more we were amazed by how few limitations it has. All the ports are on the rear, and there is a folding foot plus a tripod mount underneath, with the focusing dial on the right next to the lens/bulb assembly. And that lens was the first item that drew our attention – because there isn’t any lens cover included, so dust is free to gather at its leisure. In the box, you do get a soft carrying bag, but there isn't anything stopping the cables and PSU scratching the outside of the lens while in transit. Aside from that omission, this piece of Aukey hardware seems well specified for the projection role. In terms of ports, around the back you’ll find the usual suspects, including HDMI in, AV in, audio out, two USB ports (one USB 2.0 and the other USB 3.0), a microSD card slot and an RJ45 Ethernet port. That last connector hints that while the Aukey is made to be very easily transportable, it could also be used in a permanent installation. The placement of the remote sensor on the front and not the rear also supports the assertion that it’s meant to be placed behind the viewer. The native 1280 x 800 resolution is high enough so that a 1080p desktop sent through the HDMI port is still readable, and with 250 Lumens brightness the makers claim this device can project a screen up to 120-inch. The throw ratio is 1.5:1, so achieving the 120-inch projection would require a 15-foot throw. Another point of interest is the remote control, something that the designers evidently spent some time considering. Instead of making a remote that’s small and easily lost, the Aukey controller is a decent size and contains a great selection of useful function keys. It even has a ‘mouse' mode, where a pointer will appear, and you can move it around with the cursor pad. It’s not as helpful as an actual touchpad, mind, but it does the job. The importance of this feature is that the Aukey Projector doesn’t just have a settings page or input selection, but a complete Android system, capable of the same functionality that you might find in a cheap phone or tablet. Therefore, if you don't like the remote, you're free to attach a real mouse or keyboard to the Aukey Projector, as with any other Android device. Once again we see the deployment of Android as a means to achieve lots of functionality without building it all from scratch. The Aukey Projector is built around Android 4.4.4, the last of the KitKat incarnations before Google moved up to Lollipop. And, as these things go, the Aukey Android distro is one of the better attempts that we’ve seen for a device which isn’t a phone or a tablet. Thankfully this offers access to the official Google Play store, allowing you to install almost any application that doesn’t need a camera, touch or other phone-related hardware. On the projector by default are YouTube, Netflix and Hulu apps, but you can quickly add other services, like Amazon for example. There is only 3GB of internal storage, though you can add a microSD card to boost the available storage, and use an Android utility to install some apps and any data on the extra space. However, Android on this device isn't perfect. It has a habit of occasionally crashing apps with little or no warning. We hope they find the memory leak that causes this to happen and fix it up, because in many other respects, this Android distro is better than the efforts seen on most appliances which make use of Google’s OS. Providing useful extra functionality to the projector certainly elevates it above many of the poorer Android-based smart TVs. Our only concern is that many new applications are setting Android 5.0 as the new low watermark for installation, and fewer are supporting 4.x in the future. The limitations of making a projector this small primarily revolve around the amount of light the bulb can generate in such a tiny enclosure without melting the plastic construction. The 250 Lumens that this device can generate looks very modest compared with the 700 or more that most DLP projectors offer, and some can output 2,000 Lumens at a similar price point. That restricts how far the image can be thrown, and also what natural lighting conditions the projector can realistically handle. Aukey quotes 120-inches as the limit for the size of the projection, as we’ve already mentioned. We'd contest that an 80-inch projection is a more realistic expectation, at least without eliminating all other sources of light. In testing the Aukey performed well, hitting nearly 200 Lumens at the default 50% brightness settings. The makers of these devices are often tempted to overstate their brightness rating, and it’s refreshing to see that the quoted output for this device is pretty accurate. If this design has a weakness it's the relatively low contrast ratio of 1000:1 – or is it just that the company is very honest about that too? With that brightness and contrast ratio the Aukey Projector was never going to shine in a brightly lit environment, but in a dimly lit room the picture quality is more than acceptable. For lounge use, fan noise should be expected from the outset, but it's not overly distracting and doesn't ramp up as with other projectors we've tested. As all projectors do, the Aukey can get warm after a while, but it never reached a level where we became concerned that it would overheat. This is a great little projector that does everything the maker claims and a good bit more besides. It combines a highly portable device, and a sharp, well-saturated projection, with a decent Android implementation. While the OS could stand a little debugging, when it works cleanly it shows how useful this platform can be in this context. We would like to have seen a lens cover included, but that’s a relatively minor omission.